Virginia Governor Terry McAuliffe and his appointees to the Virginia State Board of Elections seem determined to ensure that felons and non-citizens can illegally register and vote in elections without getting caught. – having been adjudicated incapacitated. The bill would have required the sheriff or clerk of court to “make such information available, upon request, to the general registrar for that locality,” so that the general registrar could cancel the registration of those individuals deemed ineligible to vote. The bill was clearly intended to prevent illegal registration and voting by non-citizens, felons and others ineligible to vote in Virginia. Governor McAuliffe vetoed the bill, claiming in his veto explanation that he was “committed to protecting the voting and civil rights of Virginians” and that “additional study” was needed. Nowhere in his explanation did Governor McAuliffe explain why such a logical, simple and straightforward bill needs more study or how it would violate the civil rights of Virginians. After all, it simply ensured that election officials had the same information that jury commissioners have on the status of individuals who are called for jury duty based on voter registration rolls. In the meantime, illegal voting continues to occur in Virginia. In 2011, the Fairfax County Electoral Board notified the U.S. attorney for the Eastern District of Virginia and the U.S. Department of Justice of 278 registered voters who, when they got their driver’s licenses, had told the DMV that they were not U.S. citizens. Of these registered voters, 117 had in fact voted in state and federal elections, despite the fact that voting by a non-citizen is a misdemeanor punishable by up to one year in prison. According to the Washington Post, the chairman of the Board of Elections, James Alcorn, said that these proposed changes will “make it easier for eligible Virginians to participate in the electoral process,” and that the focus of voter registration should not be “whether the voter is able to complete the form,” implying that these questions are so confusing that they are somehow disenfranchising eligible voters. Every vote cast illegally by a non-citizen or by an individual who is ineligible for some other reason such as a felony conviction negates the vote of an eligible voter. The Virginia government should be acting to protect the votes of eligible citizens, rather than shielding illegal voters from detection or prosecution. But the latter is exactly what Governor McAuliffe and his appointees on the Board of Elections will be doing if this change is made. Why are they doing this? Perhaps it has something to do with a recent report on the huge influx of immigrants into Virginia that appears to be turning the state blue, since a majority of foreign-born residents favor the Democratic Party. The same is true for felons: Felons vote overwhelmingly for Democrats. 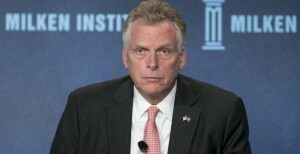 Or perhaps McAuliffe, et al. have in mind the report released last year by three professors from two Virginia universities that estimated, based on survey data, that 6.4 percent of the non-citizen population voted illegally in the 2008 election, enough to have changed the outcome in a number of states, including North Carolina.